A truely fascinating artist like this, certainly deserves his very own thread. . . . Me thinks. Charlie Morrow (b. 1942 in Newark, NJ) is a composer, sound artist, performer, and innovator whose goal over the past four decades has been to bring experimental sound and music to a wider audience. And, through avenues including concert performances and ad jingles, city-wide events and film soundtracks, museum sound installations and hospital sound environments, his work has in fact been experienced by a wider audience than most creative artists can claim. 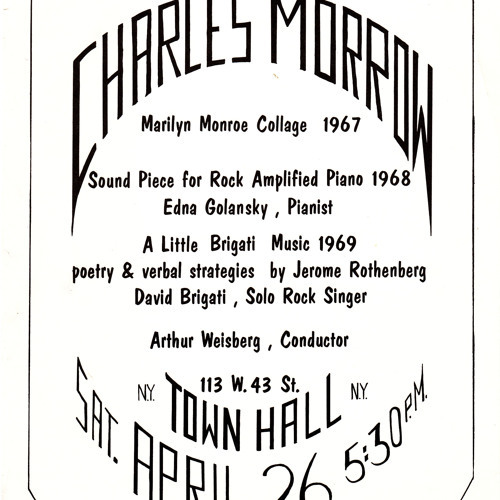 A composer who studied with Stefan Wolpe and worked with avant-garde Fluxus artists in New York in the 1960s, Morrow has written works that range from a sound portrait titled Marilyn Monroe Collage to Toot ‘N Blink, an orchestrated chorus of boat horns with blinking lights, as well as the soundtrack to the acclaimed 1970 documentary Moonwalk One and innumerable ad jingles, including those for Hefty trash bags (“Hefty, Hefty, Hefty! Wimpy, wimpy, wimpy!”) and Diet Coke. In 2010, he was honored in New York with Little Charlie Fest, a five-day celebration of his work presented and organized by Michael Schumacher/Diapason Sound Art Gallery, John Doswell Productions and WFMU FM in association with Steelcase. And in 1979 he founded Charles Morrow Productions and built a global network for sound explorations. In the 21st century, he created MorrowSound® state-of-the-art technologies—including True3D sound and 360° VR sound (see below)—at the forefront of the rapidly-expanding field of immersive sound. His work in the creation of sound environments is currently showcased in venues worldwide, including the Magic Forest & Aviary at Nationwide Children's Hospital in Columbus, Ohio; Marimekko’s New York flagship store on Fifth Avenue; SC Johnson’s corporate headquarters in Racine, Wisconsin; and the Hall of Planet Earth in the Rose Center for Earth and Space at New York’s American Museum of Natural History. 7706C - Hour of Changes​.​. "Regulated Spontaneous changes within a flow." Charlie Morrow, New York composer, chanter, and producer, was also artistic director of the New Wilderness Foundation. 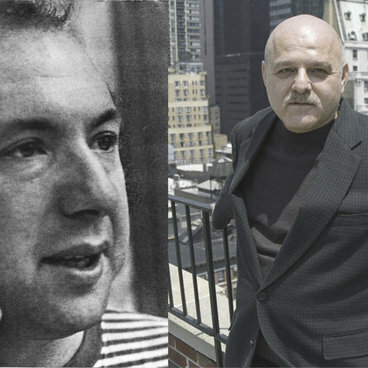 Twice a CAPS winner, his work has been performed at Alice Tully Hall ("An Evening with the Two Charlies: Ives and Morrow" 1973), on Little Neck Bay off Queens ("New Wilderness Cross-Species Event for Fish," 1974), at Dartmouth College and Cooper Union ("The Western Wind" 1974, 1977), The Museum of Modern Art (Summergarden, 1975, 1977), and many times at Washington Square Church and elsewhere. He is also known for his work as a writer and producer of jingles for TV and Radio. "In these chants, Charlie Morrow moves over new ground into the oldest habitation of man's breath and voice: the exploration is very intense, very extended. He is teaching us a language that predates language, that grows as a language itself must have grown in the music of the first shamans and poets. For this is very much a poet's music: attentive to voice and to syllable, projecting them out where they can enter the process of healing and of waking in our own lives... I admire Charlie Morrow's concerns and his accomplishments. I rejoice to see him stalking his own voice as it leads him to what must be some of the most remarkable music of our time." -Jerome Rothenberg, Anthologist of a Book of Testimony, Shaking the Pumpkin Ritual: A Book of Primitive Rites and Events and Technician of the Sacred. "I have always loved secret codes. As a kid in New Jersey, I became a ham radio operator. Music was the ultimate secret code, and I used it as a language to communicate with people through the unique situations that composing a piece for someone would provide. The occasion was magic and still is, as magic as the music itself. "Jerome Rothenberg inspired me to do a personal music using my voice after I recorded him singing his total translations of Navaho Horsesongs. "I had been asking people to get in front of the mic in my studio and do half-hour uninterrupted transmissions - mixtures of self-reflection, free association, silence, and complaints. "So I got myself in front of the mic and chanted three times on a Saturday. These early chants involved elaborate studio schemes to make them tasks I could keep my mind on excitedly. Late Afternoon Chant and Evening Star Chant are from this group. "In workshops, particularly those with Richard Schechner's Performance Group, I explored healing via singing and synchronous breathing. The nonverbal language I used was my own secret code. But others seemed to understand and be able to create their own. We evolved "A Healing Piece." (See "The Painted Bride Quarterly", Vol. 2, no. 4, shop at that time in my mind was purging and manifestly emotional. The testimony of the celebrant/storyteller/patient is typified by Drum Chant. "Later work focused on synchronized breathing as a communication and mutual experience of internal states. Breath Chant is a madrigal of breathsounds, designed to stimulate interest in breathmusic and encourage relating via breath. "As chanting evolved the voices within my voice, my personal cast of characters, personal deities, came forth. I have used them in stories, in improvised dialogues, for self exploration, to underscore looking at the world of nature, as well as to tune my mind into my dream channels. The assortment of chants in Healing Chants comes from this work. "In an Hour of Changes minutes are counted aloud, and the chanters have to change characters off the top of their heads, smoothly and without self conscious reflection. "Recent chanting involved one to one performances while Chanting for Visions. I do not listen to the voice but follow the mindscreen and use the voice as a control. The music is less predictable, my observers find, than when it is done with self listening." To celebrate the digital release of these original cassettes, we spoke with Morrow about his rare collection of music, his relationship with technology, and the future of New Wilderness Audiographics. We also chose five intriguing releases from the label to help ease you into this otherwise daunting collection. . . .
One act opera sung by rock star, Dave Brigati with the voice of his mother, band with trumpet and percussion. This is live performance recording is from Town Hall, New York, April 26th, 1968. - "It is with such pleasure that I introduce the first vinyl LP by composer/event-maker Charlie Morrow. Toot! Tooculls performance recordings from 1970 to 2014. It focuses on his Wave Music series, which are compositions based around swarms of like-instruments; i.e. sixty clarinets, conch choruses, and an army of drums and bugle horns, etc. A personal favorite is the 1978 piece, “100 Musicians With Lights,” which was performed at dusk in Central Park. One hundred players (brass, reeds, percussion) congregate and march in spiral formations, playing their instrument with penlights attached to them. The piece dissipates and ends as each player marches through the park to their respective homes. The sound is fascinating; a tape recording made by an audience member swirling and dancing through the performance. Charlie is an organizer: one of instruments, with the pieces that landed on this LP and dozens more; one of events, through decades of public Solstice celebrations across the world; one of publications, including New Wilderness Audiographics and EAR Magazine; and, one of friendships as Charlie has kindly introduced me to many fascinating players in this quirky game of ours. He views networking as an art form, always connecting friends with other friends, building a larger web for us to dance throughout. In working on this LP over the past years, Charlie Morrow and I have become close. It has been a joy to have him in my life. At the age of 73, he is determined and creative and as positive as ever. Each time we speak, new projects arise – like a mysterious soup boiling up fresh aromas. One of my favorite memories with Charlie was us staying up ’til the wee small hours of the morning drinking a bottle of sweet potato shochu, me listening to him tell funny and poignant remembrances. I am happy to share these lovely recordings, just a pinky toe in his artistic footprint, but wow, such a gorgeous toe!" Well, I wonder how it's possible this is the first time I've seen this thread. Thanks for the revisit & putting me on to ensemble 0.